A project combining interior design, spatial planning and visual identity for the workspace of an international company specialized in digital marketing and communications. The space rented by the company occupies the 3rd and 4th floor in an office building with аn area of 400 sq.m. for both floors. The employees are preliminary young, creative people, whose needs and expectations are not satisfied by the present work environment. The proposal suggests spatial optimization and reorganization as well as achieving of a more informal environment in the office with the different functional areas for work, meetings and recreation diffusing. The structural organization of the company is based on several departments occupying different spaces, each with its own needs and requirements. Every space is treated individually with the hexagon as a unifying element. All existing desks are replaced with new ones allowing for various spatial configurations in accordance with the work in groups and teams. The shape and size of the desks are carefully examined to optimize the use of space and satisfy the requirements for the number and positioning of the work stations in the different areas. The Cinema Room as a focus point and main representative space of the company is separated into two areas – light /white/ and dark /dark grey/ with the separation dominating all space-forming elements – the flooring, the paint on the walls and ceiling, the furniture, the lighting. Modular plywood panels forming lightweight structures, furniture elements, curtains and color are used to separate areas in the larger spaces. 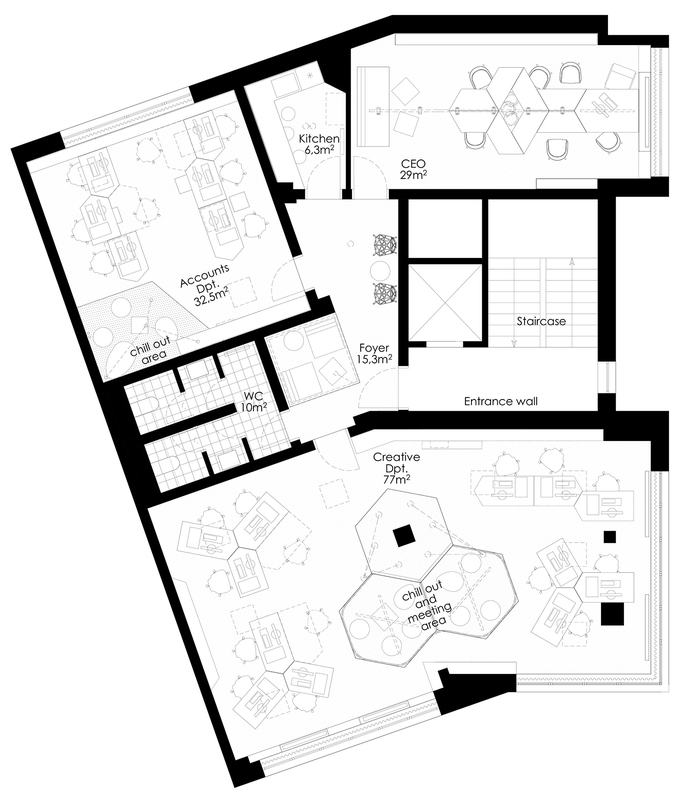 The resulting sub-spaces change the scale and dynamics of the office environment.